I love discovering new, research-based scientific approaches to teaching and parenting. My library will help you access the brilliant brains behind my blog. Click the book title to easily access via Amazon. The author of this article explains what I find myself explaining all the time as a mindfulness educational consultant, that mindfulness isn't just some warm, fuzzy, feel-good nonsense, but proven through scientific research to change the brain. He shares the effects that media and social media have on cognitive bias, and how that affects our brain, health, and the overall well-being of our country. If you, like me, are worried about the state of the nation, for our children's sake, please read this article with an open mind, and make a difference in your life, and the lives of your kids so they're not growing up with the stress, fear and suffering so many are experiencing currently. Favorite quote: "Mindfulness isn't warm and fuzzy. It's cool and clinical." UnSelfie. Why Empathetic Kids Succeed in Our All-About-Me World by Michelle Borba, Ed.D. This title intrigued me, and the book hasn't let me down. Dr. Borba shares the research supporting the importance of empathy in academics, leadership success and excellent performance, calling it the "empathy advantage". It is a great book for teachers or parents who want to foster empathy in their children with practical tools for doing so. Favorite quote: "If we want to raise empathetic, courageous, caring kids, we need to teach them how." I listened to this entire 14 hour lecture on Audible, and as soon as it finished, I started it over... it's that good. Dr. Siegel explains how mindfulness works to change the function and structure of the brain. He also walks you through several mindfulness exercises, and gives homework to enhance your own mindfulness practices. Favorite quote: "We are in the midst of an explosion of scientific research demonstrating that our survival mechanism served the needs of our ancestors, but is at the root of many problems that we face today." 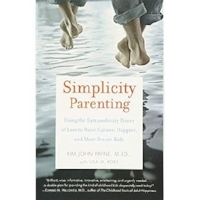 Simplicity Parenting by Kim John Payne, M.Ed. We've simplified our house, so why not our parenting style? I am listened to this book on audible, then bought it immediately because it was full of helpful tips to get back to the basics, which is what kids need to learn and flourish. It provides research-based suggestions to make parenting more simple in this crazy, competitive world by having, doing and consuming less. In doing so, we will raise calmer, happier more secure kids. Favorite quote: "Behavioral tendencies can be soothed or relaxed by creating calm." Grit. The Power of Passion and Perseverance by Angela Duckworth, Ph.D. I've been a fan of Angela Duckworth's for years and was thrilled when she published Grit. Her research proves that character is at least as important as intellect, and that we can teach students to have character strengths such as grit, self-control and perseverance. The book Grit explores successful sports teams, schools and businesses that foster a gritty culture, and because of that, are hugely successful. Favorite quote: "In order to help chronically low-performing, but intelligent students, educators and parents must first recognize that character is at least as important as intellect." The authors of this book use the latest research in neuroscience to provide strategies to parenting that are effective, and foster health brain development. They easily explain how a child's brain is wired, and how that affects their emotions, behavior and actions, then provide approaches for parents to deal with real-life scenarios in order to develop calm, happy and emotionally intelligent children. Favorite quote: "New findings in the field of neuroplasticity support the perspective that parents can directly shape the unfolding growth of their child's brain according to what experiences they offer." This is my new favorite book! What our children need to thrive: connection, communication and capability, has never changed. What has changed is a lack of unstructured playtime, the influx of technology and childhood responsibility at home, all causing the brain to develop differently, leading to more mood and behavioral disorders in our children. This author doesn't suggest turning back in time, but provides well-research strategies for parenting children in today's society so that our children grow into healthy, competent, kind adults. Favorite quote: "Our job is to help our kids understand their own internal roller coasters of emotions and stressors and to help them discover their unique tools to manage that ride. That's simply impossible unless we first get in touch with and learn to master our own turbulent internal landscape." The research is clear that children must spend the first three years of life in an environment with plenty of responsive interaction from caring adults to develop optimally, but children growing up in adversity typically don't experience this. So, then what? Tough explores how educators can overcome the negative cognitive effects of those growing up in poverty by creating calm, safe learning environments. Favorite quote: "Science tells us that parents, and the environment they create for a child, are probably to most effective tool we have for improving a child's future." An oldie, but a goodie. Dweck studied achievement and success for decades, and discovered a groundbreaking idea- the power of our mindset. She reveals what all the great teachers, parents, CEOs and athletes know, that a growth mindset is crucial for long-term success. Favorite Quote: "Mindsets change the meaning of failure." Our children need to be taught skills like inhibiting impulses, managing angry feelings and considering the impact of their behavior on others because these skills don't come naturally. The authors provide research-based, commonsense discipline approaches that incorporate what we now know about children's brains- that they are ever-changing, and our actions and words can help them grow. Research shows that poverty negatively affects brain development in children, and it can be so frustrating for educators who aren't trained with the skills necessary to teach to this type of population. This book explores what schools can do to improve the environment for students to change their brains for the better. Favorite quote: "Brains are designed to reflect the environments they're in, not rise above them. If we want our students to change, we must change ourselves and the environments students spend time in every day." This book helps us understand how evolutionary psychology rigged our minds to be what they are today- anxious, depressed, angry, greedy, worried, stressed, fearful of things like public speaking in front of strangers that we'll never see again. Now, science is proving what Buddhism has long taught, that mindfulness is a means to help us separate these unnecessary worries and fears from actual reality. Favorite quote: "Buddhism holds that human suffering is a result of not seeing the world clearly—and proposes that seeing the world more clearly, through meditation, will make us better, happier people." Mrs. Srinivasan walks you through the many benefits of practicing mindfulness in the classroom, both for her as a teacher, and for her students. She even provides a very descriptive curriculum, and steps for implementation, for educators that meet the five core competencies of Social Emotional Learning. Favorite quote: "Mindfulness must be the foundation of Social Emotional Learning because it teaches students how to cultivate self-awareness." This article addresses a very important point: that mindfulness cannot be outsourced; it cannot be taught like piano lessons. If you want to teach your children (or students) to be calm, steady, peaceful, kind and compassionate, we, parents, teachers and caregivers, must embody it ourselves. The articles provides tools to stay present and calm beginning in the first year of life, and continuing on through the journey of parenthood. Favorite Quote: "Children are uniquely suited to benefit from mindfulness practice. Habits formed early in life will inform behaviors in adulthood, and with mindfulness, we have the opportunity to give our children the habit of being peaceful, kind and accepting." Thirty Million Words: Building a Child's Brain by Dana Suskind, M.D. This book is the sole reason I began blogging. Before reading it, I had no idea that a child's brain grows 85% in the first three years of life, and that optimal growth is complete dependent on ME. I figured if I didn't know this, then other parents may not either, so I began sharing the information I was reading, while using the tips in the book with my own daughter. Suskind outlines simple, free, basic tips to create a warm, loving language environment for your child to ensure he or she is set up for life-long learning. Favorite Quote: "Kids aren't born smart. They're made smart by you talking to them." The Marshmallow Test: Mastering Self-Control by Walter Mischel, Ph.D. Almost every book I read references the famous marshmallow test. Mischel's research is the most influential of our time because he was the first to use advances in neuroscience and brain imaging studies to help us understand what is happening in the brain when it comes to cognitive skills like self-control. Self-control may be prewired, but it can also be taught, and this book tells you how. Favorite quote: "We're the cheerleaders; the kids are playing the game. We set up the conditions; the hard work has to be done by each individual." -Dave Levin, Founder of the KIPP school network. Tough argues that character matters more than intelligence for success in school, and life. In this book, he explores the work of psychologists such as Seligman, Peterson and Duckworth as they implement research-based approaches to teaching character strengths such as grit, curiosity, self-control and optimism in KIPP schools across the country. Favorite quote: "Character is a set of abilities or strengths that are very much changeable- entirely malleable, in fact." Becoming Brilliant: What Science Tells Us About Raising Successful Children by Kathy Hirsh-Pasek, Ph.D. & Roberta Michnick Golinkoff, Ph.D. This book provides ways to fully enjoy the experiences of life and the world by becoming completely aware of it, rather than withdrawing from it. It guides us to set aside ego by removing the "I" "me" and "my" that society trains us to be so concerned about to to fully appreciate the little moments, people, experiences and joys of life. Favorite quote: "Try sharing the fullness of your being, your best self, your enthusiasm, your vitality, your spirit, your trust, your openness, above all, your presence. Share it with yourself, your family with the world."